We have a Coleman roof-mounted air conditioner on a mini-motorhome. The air conditioner works great but sometimes it leaks inside on hot days. We believe we have checked everything, yet it still leaks on those hot days. Mary, there are basically two possibilities; one, either the seal between the roof and the bottom of the air conditioning unit has lost its elasticity or two, it's actually condensation dripping inside the RV. Or both. It's quite common for roof air conditioners to produce lots of moisture in the form of condensation. The moisture that is removed from inside the RV must be relocated to the roof of the RV where it usually evaporates. 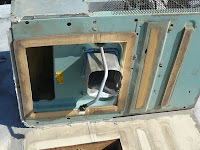 On very hot and humid days, well over 35% of the energy used by the roof air conditioner is for moisture removal alone. On those types of days quite a bit of water may collect in the pan of the air conditioner. If the drain holes through the pan are clogged with debris or leaves, the moisture may drip back into the RV, especially if that same unit has a deteriorated gasket seal. It's very possible the seal has deteriorated to the point of needing replacement, especially if the same seal has been in place. Obtain a new 14-inch seal from your local RV service center. It doesn't matter which brand of air conditioner, they all require the same size seal. You can see the 14-inch square seal and the round drain holes in the photo. The unit will have to be removed and remounted when replacing the seal. Also be sure to clear any debris from the drain holes in the air conditioner pan. It may be necessary to remove the exterior shroud to examine the drain holes. This should eliminate the moisture from entering the RV. Be sure to check the other roof seams and sealants while up there.